What are some cdrw drives that Best Buy sells that are rebadged liteons? Also, with these rebadged drives, will I be able to use Liteon's own firmwares to update each specific rebadged drive? Thanks in advance. The Sony is your best bet, currently that is the only LiteOn on the shelf at my local BB. 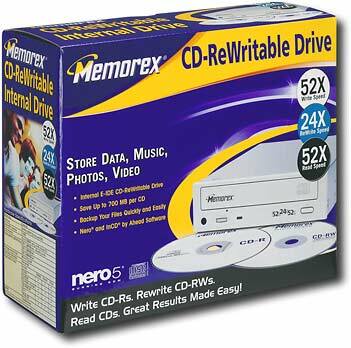 Memorex drives are usually (if not always) Lite-On, but I am not sure if Best Buy sells them. I have purchase two rebadged LiteOns at Best Buy: Memorex and Verbatim. Both were bundled with Ahead Nero software. I've heard that the Sony has crummy software, the Ahead Nero is much preferred. If you have software that you are happy with and works with any brand burner, then Sony is OK. I don't have such, that is why I purchased the other brands. If you update a rebadged LiteOn with the LiteOn firmware, the bundled (pre-mastering) burning software will not work. Again, if you have other software, you'll be OK. Try Memorex, BusLink or Verbatim. 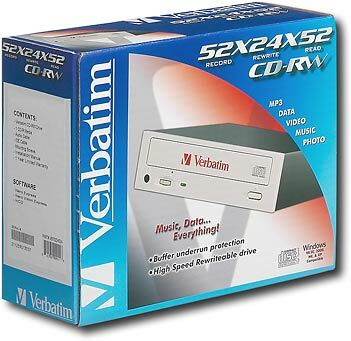 BusLink & Verbatim are also most likely to have the original LiteOn fware. Verbatim may use Aopen or Benq as well. Just FYI. My boxes look like those shown and the features on the front of the pictured drives are characteristic of rebadged LiteOns. Yes, but I had a Verbatim (48x12x48) and it pictured a Lite-On drive on the box and all the specifications were of a lite-on. In the box was actually an Aopen 48x12x50. I'm looking at mine right now. There is a label on the case that says LiteOn IT corporation. Model LTR-52246S. I'll have to install it tomorrow night and see what CDInfo says about it. Some Buslink drives are AOpen, too. My Buslink 52x is an AOpen. Buslink used to use only Lite-On. Then they started to use Aopen and maybe Benq. I wish Buslink would have stuck with Lite-On, then we could all know that we could get a Lite-On in the buslink box. Oh well. Just installed and checked out my Verbatim rebadged LiteOn. CDInfo shows it at LiteOn Model LTR-52246S firmware version 6S0D. Same with device manager. No mention ov Verbatim whatsoever. I wish Buslink had stuck with Lite-On, too. My AOpen that came in a Buslink box is not too bad, but it's not as good as a Lite-On drive with the same specifications. CowboySlim wrote: Just installed and checked out my Verbatim rebadged LiteOn. CDInfo shows it at LiteOn Model LTR-52246S firmware version 6S0D. Same with device manager. No mention ov Verbatim whatsoever. Nice! I remember that Verbatim used to customize the firmware; it's nice to know that they're not doing this anymore. CowboySlim wrote: CDInfo shows it at LiteOn Model LTR-52246S firmware version 6S0D. Apologies, dode, it's Nero InfoTool that I used. Best Buy also sells the TDK burners (which are Lite-On based as well). By using either the FlashFix or MktWinFlash tools, they can accept the comparable Lite-On firmwares. aviationwiz wrote: Buslink used to use only Lite-On. Then they started to use Aopen and maybe Benq.